Welcome to the four hundred and thirty-fourth of my blog interviews with novelists, poets, short story authors, biographers, agents, publishers and more. Today’s is with contemporary and historical novelist, non-fiction author and spotlightee Dorit Kedar. A list of interviewees (blogged and scheduled) can be found here. If you like what you read, please do go and investigate further. Morgen: Hello again, Dorit. Please tell us something about yourself. Dorit: I am the modern version of the wandering Jew. I try to be 6 months in a beautiful and serene spot somewhere on the globe, and 6 months I am in hectic Israel. Dorit: Until 5 years ago I was a ghost-writer. Therefore I wrote in any genre possible: academic books, short stories, children books, love letters and so on. Since I started to write my own material, I published in English a nonfiction book: Lilith: The Jewish Demoness – 1000 Years of Border-Line Personality Disorder and a fiction book: Letters From The Red House. Morgen: ‘Demoness’ I love it. 🙂 Do you write under a pseudonym? Dorit: Just now I published Lilith in my own name. Maybe to an English-speaking ear it might sound like a fake name. Morgen: I think it’s a great name. Have you had any rejections? If so, how do you deal with them? Dorit: Ohhhh I had 1000 rejections and it is not just an exaggerated number. Well what can you do about it? Run as fast as you can to the airport and catch the first flight to anywhere. Morgen: Hectic Israel would keep you too busy to think about them. I’ve had about thirty so that pales into insignificance. Are your books available as eBooks? 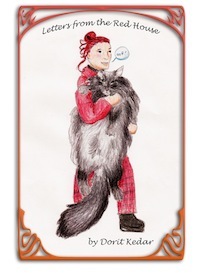 Dorit: My 2 books are available as eBooks. In Israel I gave quite a few lectures after my Lilith book was published. I talked about a fascinating traditional magic society that recruits all kinds of supernatural entities (angels and demons) to help it influence and alter its immediate reality. Also an important part of the book which I talked about was that Lilith as a she-demon reveals the varied hidden faces of the Jewish woman – as a wife, as a multi-disciplinary expert craftswoman and as a sorceress. Dorit: I think the title is most important. Personally I can write only when I find the perfect title. When I had an interview on Israeli TV, the host said that if the book won’t sell, I can definitely find work in an advertising office and write slogans. Luckily Lilith found her place in universities and libraries. Regarding the cover, of course, it is important. My daughter Lola Kedar designed the cover of Lilith. I’m delighted with both covers; each captures the essence of the book perfectly. Morgen: They’re both very striking. Dorit: My friend Mollie Carson-Vollath designed the cover of Letters. Morgen: Oh wow, say “hi” to Mollie for me please, I enjoyed our interview and spotlight (which I know produced at least one sale for her book Terrence O’Ferret :)). What are you working on at the moment / next? Morgen: You clearly love feisty women. Comish in German means funny. 🙂 Do you manage to write every day? Do you ever suffer from writer’s block? Dorit: I write at least 5 hours a day, sometimes much more. Writer’s block appears sometimes usually when I am about to finish a book. Morgen: Oh how annoying! Do you plot your stories or do you just get an idea and run with it? Morgen: Hopefully in a good way. 🙂 Do you have to do much research? Dorit: Oh… yes. In preparation for Lilith, I investigated the Lilith affair for at least 10 years. I read every article that might have contributed “news” about her deeds. For Letters, it depends. If listening to gossip is considered research, then, yes. I collected gossip about the colorful people in the area and used it in the book. For my last book “Fake Biography of a Real Woman” I was “serious” again and created the heroes, their behaviour and beliefs, according to the things that were customary in the 5th century. Morgen: 10 years, wow. My research tends to be Google and Wikipedia and that’s about it but then I write present day so it’s easier. Do you have pieces of work that you think will never see light of day? Morgen: Oh dear. If you could invite three people from any era to dinner, who would you choose and what would you cook (or hide the takeaway containers)? Dorit: I am the worst cook on earth, so probably they will have to eat two sunny side up eggs and a piece of toast. And who will have the honour? The cave woman who invented the wheel, Frida Kahlo de Rivera and Buddha. Morgen: Sounds good to me. Is there a word, phrase or quote you like? Morgen: I love that. Where can we find out about you and your work? Dorit: On my site you can find a lot about Lilith and other demons in the time of antiquity. Morgen: <laughs> Is there anything you’d like to ask me? Dorit: Ask? No. Just to thank you for giving us writers this opportunity. You are great Morgen, really. 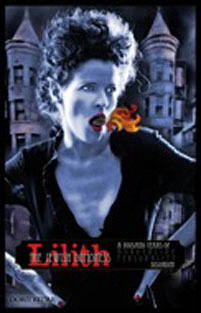 Dorit: Just few words about my book: “Lilith: the Jewish Demoness – 1000 Years of Border-Line Personality Disorder” – No she-demon has ever achieved a fantastic career as Lilith. By her beauty and naughty behavior, one might think that she is much younger than 4000 years. Thousands of books have been written about this beautiful, promiscuous and vampiric demoness, but only in this book one can find the missing link of the demonic species and especially the lost chapter of Lilith’s biography. This book presents an extraordinary magical aspect of the Jewish society, it’s heroes in the times of antiquity and a panoramic view of women not only as a wife, but as a multi-disciplinary expert craftswoman and sorceress. The book is available on Amazon (kindle version) for a magical amount of $3:33. It is not easy ladies and gentlemen but it certainly worth the effort. Enjoy!!!!! Morgen: 🙂 Thank you, Dorit.